Available in (5) nib widths ranging from 1.3mm to 3.5mm. All sizes are offered in Black, while the 2.0mm, 2.5mm and 3.0mm markers can be found in 6-marker sets that feature 4 additional colors. If you’re hoping to add even more pop to your calligraphy project, the 1.3mm markers can be found in a 12-marker set featuring 12 bold, rich colors. 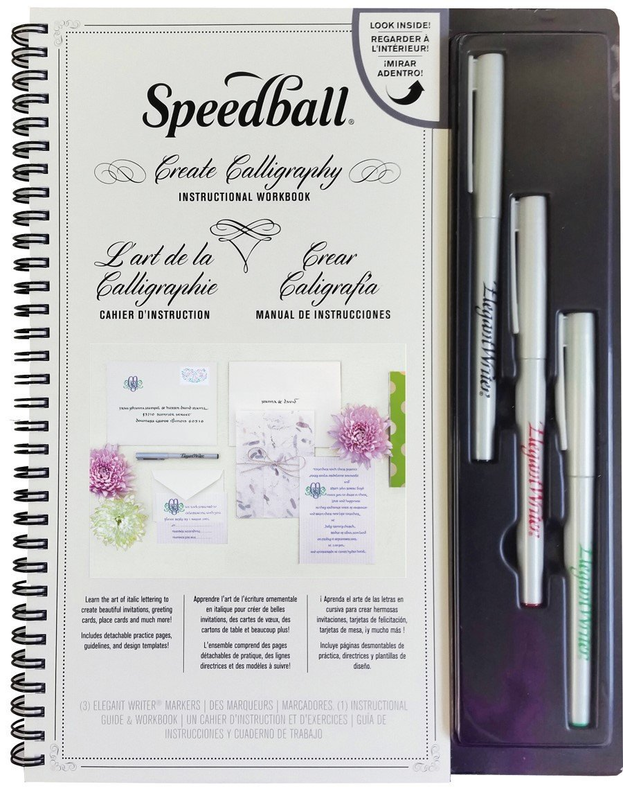 If your creative vision requires even more eye-catching appeal, try Speedball’s Elegant Writer Dual-Tipped Marker Set. 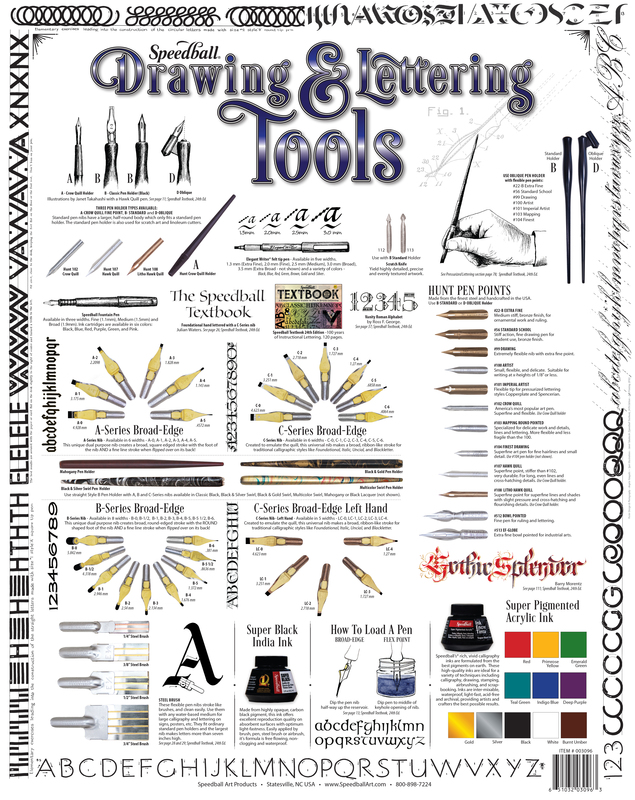 Whether making invitations or adding more dimension to scrapbook pages, the combination of Scroll and Chisel (1.3mm) ends offer artists an entirely new range of creative possibilities. 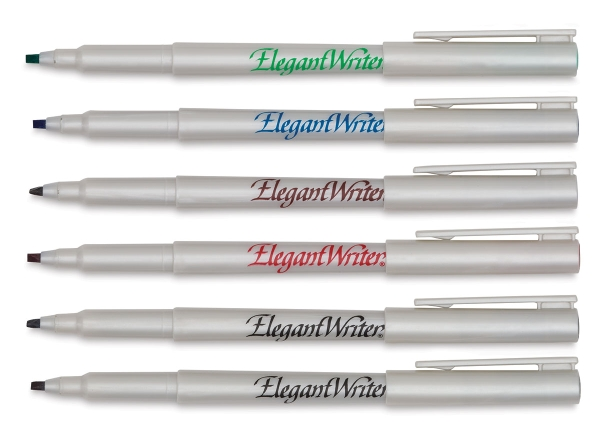 This set includes: (12) dual-tipped calligraphy markers (Red, Pink, Orange, Yellow, Lt. Green, Dark Green, Turquoise, Royal Blue, Purple, Brown, Grey, Black). Offered in Black, Red or Blue, Speedball’s Elegant Writer markers are now available featuring permanent ink in the 1.3mm and 2.0mm sizes. Perfect for envelopes, place cards or certificates! Ideal for beginners and students wanting to learn calligraphic writing, this 116-page, project-oriented calligraphy instructional workbook includes: (3) Elegant Writer® markers (1.3mm-Green, 2.0mm-Black, 3.0mm Red), removable practice pages with guide liners and practice pages.